When betting on eSports online, one of the main decisions you have to make is which payment method to use. Betting online isn’t as easy as handing over cash, so you have to consider which payment methods are safe, trusted and readily available. We take a look at some of the most popular deposit options available at the leading online sports betting sites so you can decide which payment method is right for you. Betting on eSports on the Internet is an easy process. Your first move is to decide which online sportsbook to bet at – read our reviews of the best online sportsbooks for more information. Note not all esports betting sites cater to players from all countries, so we recommend reading our country guides to familiarise yourself with the online gambling laws that apply to you and choose a trustworthy site accordingly. Once you have chosen your betting site, sign up for an account by providing your name, email, date of birth and contact information. Log in to your account, go to the bookmaker’s cashier section and choose from the list of secure payment options available. Follow the prompts to enter your payment information and complete the transaction; the funds will typically hit your betting account straight away, ready for you to place real money wagers on your favourite eSports games. When you sign up to bet real money on eSports online, the payment options available will depend on the site you are betting at and the country you are playing from. We have provided an overview of some of the safest and most popular betting options available at our recommended online sportsbook sites. Regardless of all the new online payment methods emerging, credit and debit cards remain the most popular and commonly accepted payment method for online betting. Online sportsbooks typically accept Visa and MasterCard, although some sites may also accept Entropay, which is a virtual Visa card that provides an added layer of security. To place an esports bet using your credit card, just enter your credit card number, expiry date, your name as it appears on the card and the three-digit security number on the back of your card. Enter the amount of funds you wish to deposit and Bob’s your uncle. Web wallets (also known as e-Wallets) have become increasingly popular for online payments and are widely accepted at online gambling sites. An e-Wallet is an online payment service that allows you to transfer funds online without having to reveal any of your personal financial information to the online bookie. You sign up for an account with a web wallet provider, deposit funds to your web wallet and then use your web wallet ID and password to deposit funds to your online betting account. e-Wallets are safe, fast and provide a great option for players who are placing bets across multiple sportsbook sites, as you don’t have to provide your financial details to multiple venues. 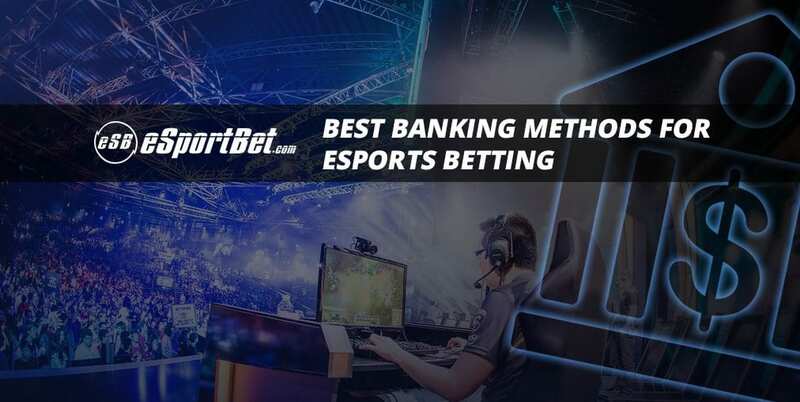 The most commonly used Web wallets at eSports betting sites include Neteller and Skrill (formerly known as Moneybookers), although some country-specific Web wallets are also available. Pre-paid cards, also known as e-Vouchers, are a good choice for players who 1) don’t have access to a bank account or line of credit, 2) are ultra-wary about their online security, or 3) would like to remain completely anonymous when placing eSports bets online. Prepaid cards can be purchased in real life retail outlets in exchange for cash, so you never have to reveal your banking information or identity. You will be given a unique PIN number, which can then be entered to your chosen online sportsbook site to transfer funds to your betting account. The downside? Prepaid cards generally can’t be made to withdraw your winnings, so you will still need to choose another payment method when it comes time to cash in from that winning eSports bet. Popular prepaid cards accepted at online betting sites include Paysafecard and Flexepin. Pre-paid Visa and MasterCard gift cards are also available in some countries, which can be used anywhere Visa or MasterCard payments are accepted. It is common for online betting sites to accept bets using direct bank transfers, so you can transfer funds directly from your account into theirs. Sportsbooks may use services like Citadel Direct to facilitate the bank transfer, or allow direct deposits via EFT or by visiting your local bank teller. The betting site will provide you with its bank account details, which you can then use to make your deposit. PayPal is the world’s first and most trusted online payment service, and it is available at several leading eSports betting sites. Like web wallets, PayPal allows users to deposit online without sharing personal financial information with the bookie, while enjoying the extra layer of security that the PayPal system offers. Players from some countries are unable to bet with PayPal depending on the gambling laws within their country. If PayPal is not available to you, consider one of the Web wallet services mentioned above, or the niche payment methods discussed below. In addition to the most common eSports bet payment options above, you may come across all kinds of country-specific payment methods when placing bets online. These are payment services that aren’t available globally, instead catering to smaller markets like individual countries or regions. Is it safe to place real money bets online? Betting on eSports online is safe, provided you stick with secure, regulated sports betting sites that are regulated by trustworthy gambling jurisdictions. The site you are betting at should also be protected by a minimum of 128-bit SSL (secure socket layer) digital encryption security, which can be identified by the padlock icon in the URL address bar. All the eSports betting sites we recommend tick the right boxes when it comes to safety and security, so punters can place bets at these venues knowing they are playing in a licensed and secure environment. If you are wary about handing your credit card or bank account information to an online gambling provider, consider using any of the alternative online payment methods above, or use a trusted VPN (virtual private network) provider for an extra layer of security.